Propylene glycol is a colorless, viscous liquid used in antifreeze solutions, in hydraulic fluids, and as a solvent. Unlike ethylene glycol, it is not toxic and is also used in foods, cosmetics, and oral hygiene products. Its chemical formula: C3H8O2. It is also called propane-1,2-diol. Chemically it is classed as a diol and is miscible with a broad range of solvents, including water, acetone, and chloroform. It is a synthetic product obtained from the hydration of propylene oxide, which is derived from petroleum products. n the European Union, it has the E-number E1520 for food applications. The compound is sometimes called α-propylene glycol to distinguish it from the isomer propane-1,3-diol (β-propylene glycol). 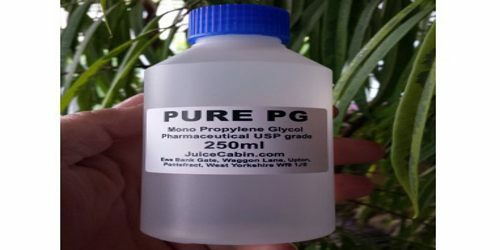 Propylene glycol (1, 2-propanediol) is an organic compound, usually a tasteless, odorless, and colorless clear oily liquid that is hygroscopic and miscible with water, acetone, and chloroform. It is manufactured by the hydration of propylene oxide. In general, glycols are non-corrosive, have very low volatility and very low toxicity; however, the closely related ethylene glycol (a key ingredient in antifreeze) is toxic to humans and to many animals. The propylene glycol molecule is quite stable and doesn’t decompose over time. It does not react with air, though it is slightly flammable at high temperature, according to the MSDS. A significant and important chemical property of propylene glycol is that when it mixes with water, it disturbs the formation of ice, which leads to its antifreeze utility. While water alone freezes at 32 degrees F, 36 percent solutions of propylene glycol are liquid to 0 degrees Fahrenheit, and more concentrated solutions freeze at lower temperatures still. According to the Material Safety Data Sheet (MSDS) for propylene glycol, it’s a colorless liquid with a slightly sweet taste and is notably more viscous than water, meaning that it flows slowly, like syrup. Its melting point is -72.4 degrees F, and its boiling point is 370.8 degrees F. It has a specific gravity of 1.036, meaning that it is only slightly more dense than water. Its vapor pressure at normal room temperature is negligible, so propylene glycol does not evaporate to any significant degree. 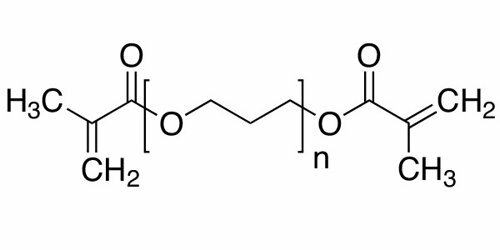 Polypropylene glycol (m w 1, 200-3, 000) is used as a food additive (“EAFUS: Everything Added to Food in the United States.”). 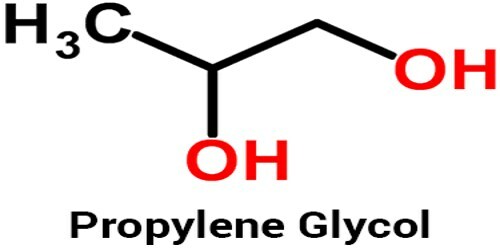 Polypropylene glycol (m w 1, 200-3, 000) belongs to the family of Secondary Alcohols. These are compounds containing a secondary alcohol functional group, with the general structure HOC(R)(R’) (R, R’=alkyl, aryl). 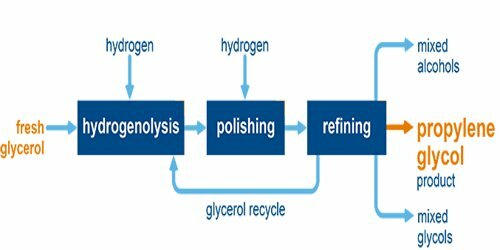 Forty-five percent of propylene glycol produced is used as chemical feedstock for the production of unsaturated polyester resins. In this regard, propylene glycol reacts with a mixture of unsaturated maleic anhydride and isophthalic acid to give a copolymer. It is used in veterinary medicine as an oral treatment for hyperketonaemia in ruminants. Glucose, which can be used in non-ruminants for this purpose, is not effective due to its consumption by the resident microbes of the rumen. Propylene glycol is partially metabolized in the rumen to propionate which can be used as an energy source. The remainder is absorbed into the bloodstream and used by the liver for gluconeogenesis. Some of the side effects experienced by people that use propylene glycol are muscle pain, sore throat, and stronger smelling urine. These symptoms can all result from using e-cigs that use propylene glycol-based e-liquid. Since PG is considered a humectant, our throat can become dry after use and potentially sore. It can also result in an increase of lactic acid production by our body causing muscle aches that occur more often than normal. In order to counter-act these symptoms it is recommended that we increase our fluid intake in order to flush the lactic acid from our body more quickly. This will also help with alleviating our sore throat more quickly which normally disappears after a few days of starting vaping. If we find ourself beginning to suffer from loose bowel movements, a rash, or having night sweats us may be allergic to propylene glycol. If this occurs we will need to seek out an electronic cigarette solution that is vegetable glycerin (VG) based instead.